Today was a big day for our little 12 month old. In fact, today was such a big day, it’s earned an entry on Noah’s lifetime milestone list! So what happened today that was so amazing? Did he ride a dinosaur? Nope, been there, done that. Well, did he ride an elephant? Nope, been there, done that as well. In fact, today’s milestone even tops Noah’s first trip to the comic book store! Which, by the way, is a big deal when you have a geek for a father. Ok, are you ready….wait for it…here it comes….today our 12 month old, dashing, adorable, son had his VERY. FIRST. KISS! 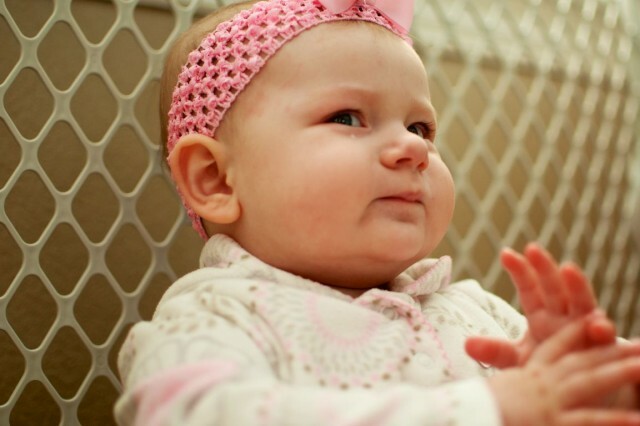 Don’t get me wrong, we don’t endorse first kisses for one year olds or anything. He can’t even sign “I Love You” yet. Besides, did you happen to notice how un-smooth he was with his post-kiss flirting in the video? He got a little nervous and tripped over his toy….so he’s still got some growing up to do. However, it looks like our little boy’s going to be quite the ladies man, so we’ll have to keep our eye on him. She’s playing hard to get…. Lilly’s the daughter of our friend Laura (who, by the way, makes amazing texture blankets) and is about 6 months younger than Noah. Since my wife and Laura are best friends, he’s got to hang out with Lilly a lot. It’s been a ton of fun watching them interact and play. And in case you’re wondering, yes, it is possible for guys and girls to just be friends. We’re extremely blessed that Noah has a such a wide variety of friends to share life with. Some of his friends have Down syndrome, and others do not. We think it’s important for him to be accepted and included with people who don’t have down syndrome, and we also what him to have friends that know exactly what it’s like to have an extra copy of your 21st chromosome. 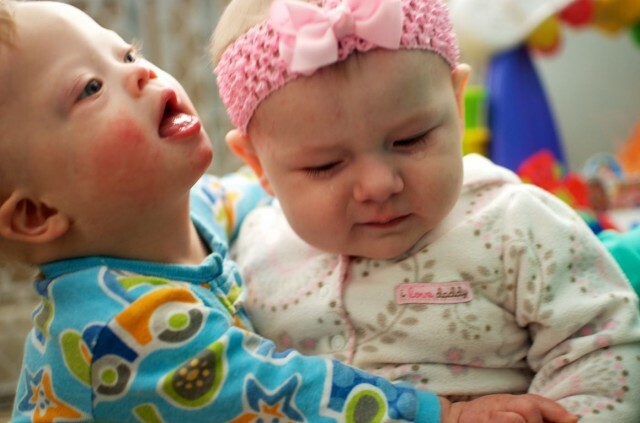 Lilly has no idea that Noah has Down syndrome and probably won’t for years. That is the other lovely thing about friends at this age, they have no idea the differences that the world knows too much (or should I say too little) about. Noah and Lilly love each other just because. They don’t judge. They don’t comparemilestones. They don’t make fun of each other, or hurt each others feelings. Today provided some serious entertainment as Lilly got a little boy crazy and gave Noah his FIRST KISS. She just crawled right up and smacked one on him. I can say I don’t blame her since he is a such a handsome little boy, if I don’t say so myself. 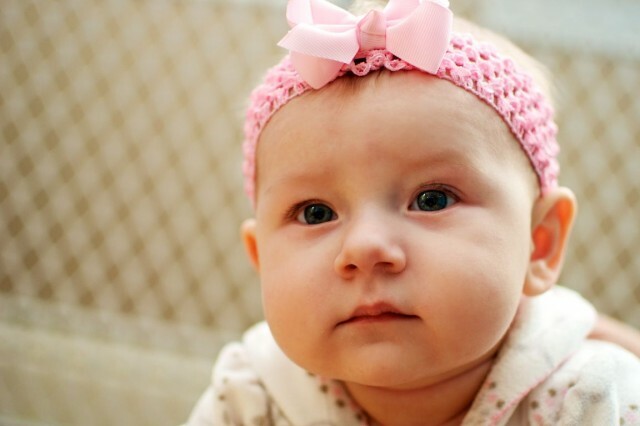 Noah responded appropriately by pulling her headband, and snapping it against her forehead…just like a typical boy. I think Lilly forgave him. I hope these two have years of adventures in front of them. Did I mention Lilly is also a ninja? Who do you consider your child’s best friend? What are some funny things you have seen them do together? Bonus points if you share a picture of your child and their best friend in the comments below! well, it was me not my kid (im 13, I don’t have kids yet) I had my first kiss when I was 3 and it was with my best friend at the time who was a 2 year old boy. we were upstairs looking for a toy in the closet to bring down to play with. our older sisters were supposed to be looking after us, but they weren’t and our moms ended up finding us in the closet kissing. we got a talking to and our sisters got grounded 😀 I love kids with down syndrome! 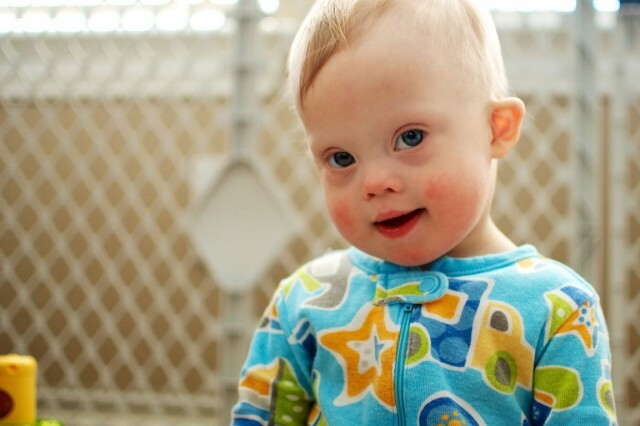 when I get older I’m going to adopt a little boy with down syndrome and name him Logan….. You are so blessed to have a little bundle of joy in your life!